Hey guys! This week lets rock with double back roll kite loop and find all the possible way to complete this trick. This one harks back a bit, watching some of the early adopters pulling the trigger on one of these back in the day was a sight to behold, large kite, no depower, heavy mutant strapped to their feet, and serious landings! Fortunately things have moved on and tricks like this are open to anyone and everyone, so certainly worth a bash and a lot of fun – possibly feels better than it looks. Pic A. This is a sent back loop, so you’ll need to come in with good speed on a solid edge and your kite no higher than 1 or 11 o’clock. With a good edge you can confidently send the kite hard enough to get sufficient height, happy in the knowledge that it won’t drift too far behind you because the lift will come early. For this same reason you must keep the bar in on the sweet spot when you send the kite. If you let it out the kite will drift further back before taking you up, and the result will be a low and slow kite loop – not ideal. You can see in image that the rider has speed and is low on as much edge as possible, driving through his back foot to resist the extra pull from his send. This will give plenty of up and keep tension on the lines during the back rotations – important for the moment you pull the bar to loop the kite. 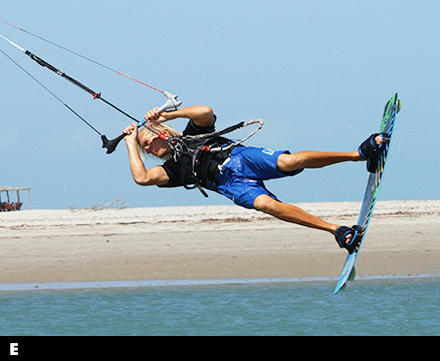 As for a normal back loop you should aim to take off with a bit of upward stamp off the back leg as this will also keep the kite above you. Pic B. Although this is a double back loop, you don’t want to be throwing a super fast spinning rotation. For those of you who can already pull of a single back loop kite loop, it’s a similar theory. In the single version you only perform half a back loop and the kite does the rest. Here for the double if we can get one and a half the kite will do the rest. Otherwise you run the risk of over rotating when the kite pulls, which won’t be the most comfortable of landings. Your aim is to rotate at a speed that will get you around 360° by the time you get to the apex of your jump, the higher you go the slower you need to spin. So give the take off a bit more than you would for your normal back loop. Even though you don’t want to overdo it, you do need to get yourself into a position from which you can rotate and maintain balance. Here the rider is already half way around his first rotation. He’s tucked up small, knees up, board close, so that he doesn’t stall or slow down. However his head is still looking through his arms, he’s not thrown it into the rotation. And he has the bar leveled and pulled into the sweet spot, to keep the kite from drifting back and also keep tension on the lines, so that the kite is primed. Pic C. Assuming that your kite hasn’t drifted too far back you should still feel it supporting/floating you as you come around your first rotation. This is the moment to pull the trigger and loop the kite. If however you feel that the kite is way behind you and that you are already starting to fall, it’s best not to pull. The rider’s momentum is taking him into another rotation. He still has the bar in and is tucked up, so all he has to do is pull in hard on the back of the bar and push away with his front hand. As fun as it is to get as much power out of the • loop, when learning you want it to get around fast so be positive with your bar movement. You can see that the rider has his back hand slightly down the bar, whilst his front hand is near the centerline. This means he can pull easily on the back, and keep the bar on the sweet spot with the front. Pic D. Once you pull be ready for the kite’s power to pull you around. Here the rider has now turned his head to look over his front shoulder. This will help him “go with” the kite as it loops, meaning that he’ll turn slowly as the kite pulls him around. Once you’ve got here you are fully committed, so keep pulling and don’t let the kite pull the bar out and away from you. Pic E. As the kite goes through its loop and starts to climb, keep the bar in and the kite turning. As long as you keep looking, keep the bar in and keep the kite moving you’ll come around. Once you can see your landing as the rider can here you know you’ve made it. Only thing left is to land downwind and then get back on your edge quickly to get tension on the lines and get the kite back under control. Depending on your height and the speed of the loop, you may need to dive the kite hard to prevent it from overflying behind you! Before bashing on with this, definitely bang out a few back loops to work out how hard you should send the kite and how fast you should rotate, then you can amp up the rotation a little bit and add the loop. This move is all about timing. As long as you don’t let the kite drift too far back on takeoff, and pull for the kite loop as you start your second rotation it will work. We’d recommend not trying this too powered up to start with, work your way up in steps, both height and power, as you don’t want to be coming in on your side or back! Kite drifting too far back during first rotation. Chances are that you let the bar out as the kite started to lift, and/or you didn’t send the kite hard enough. If you want to tone it down it is better to give a hard but short yank on the bar than to slowly drift the kite. If you’re over rotating and starting a third back roll you are either pulling for the loop to late, or spinning yourself into the first rotation with too much energy. The quick his is to make sure you pull on your back hand as soon as you start the second rotation as the kite will pull you out of it foss down wind landing. This entry was posted on December 3, 2014. It was filed under Advanced and was tagged with back, Double, expert, kite, loop, roll.